When I first moved to Paris I lived near the flea market Marché aux Puces located on the outskirts of the city. 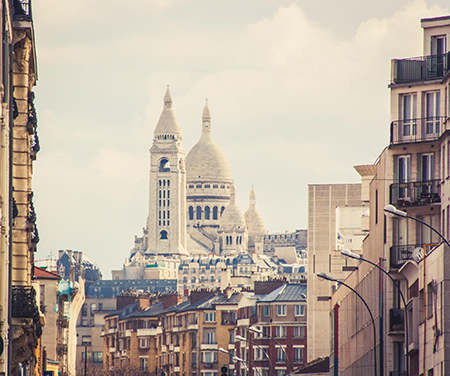 When I would go to the metro I would see this view of the the beautiful Basilica Sacré Cœur on the hilltop of Montmartre...a view that never got old. 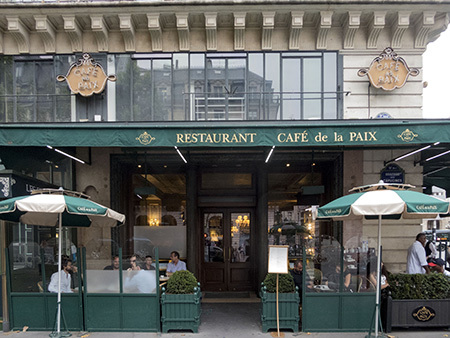 “Glamorous” and “opulent” are words that will come to mind when you enter Café de la Paix, a famous restaurant located across the street from the equally famous Garnier Opera House. Even railroads have their angels. . . 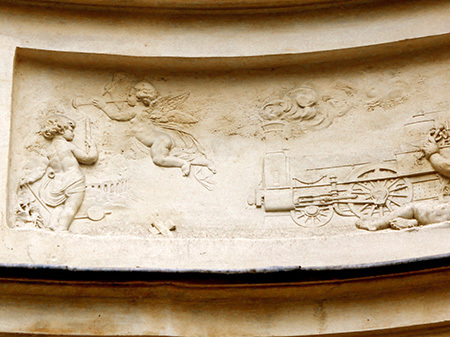 This adorable duo, chiseled with care and invention around 1870, adorns the former headquarters for the PLM Railroad Company serving Paris-Lyon-Mediterranean in the 19th century. The cherub on the left holds a points lever, used to align the points of a railway switch manually, and a torch for emergency signals. An angel in flight toots his trumpet and carries a fiery torch, symbol of daybreak, nearby a finely-drawn steam engine, billowing steam into the air like puffy clouds.